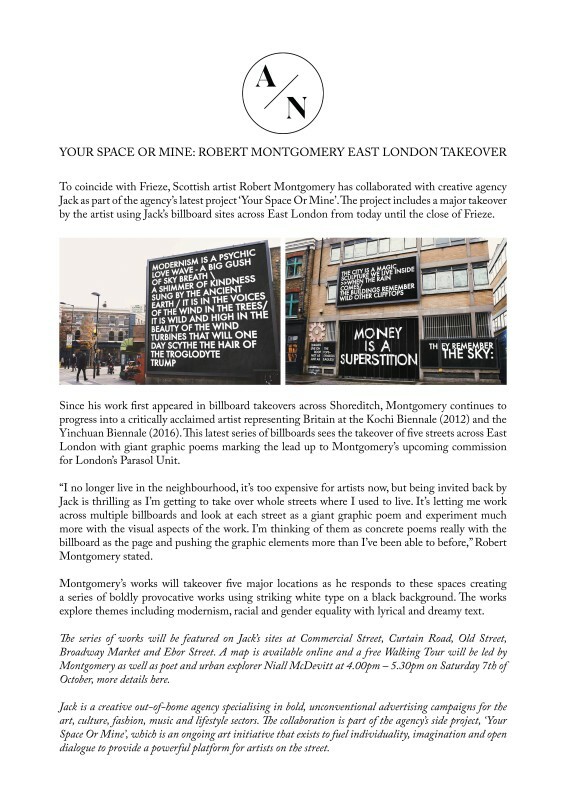 To coincide with Frieze, Scottish artist Robert Montgomery has collaborated with creative agency Jack as part of the agency’s latest project ‘Your Space Or Mine’. The project includes a major takeover by the artist using Jack’s billboard sites across East London from today until the close of Frieze. Since his work first appeared in billboard takeovers across Shoreditch, Montgomery continues to progress into a critically acclaimed artist representing Britain at the Kochi Biennale (2012) and the Yinchuan Biennale (2016). This latest series of billboards sees the takeover of five streets across East London with giant graphic poems marking the lead up to Montgomery’s upcoming commission for London’s Parasol Unit.